Who doesn’t love coffee? Everybody loves this magical drink. But, don’t you know that coffee might be worsening your acne? Actually, this topic turns out to be a pretty complicated issue. Does coffee cause acne? Before we get to know about the relationship between coffee and acne, let’s know about the coffee itself first. Coffee is a super complex drink and it contains more than 1,000 chemical compounds. This is more than chocolate and wine which contains 250 and 450 chemical compounds. Of course we already know that caffeine is the best-known ingredient in coffee. That compound gives coffees its mood-enhancing properties and incredible stimulant. But do you know that coffee also contains other things such as antioxidants, lignans, trigonelline, lignans, quinides, diterpenes, and chlorogenic acid? Coffee is, indeed, and incredibly complex beverage with a complex interplay of health benefits. So, coffee can trigger acne in their own way. Coffee can increase your body’s stress response. 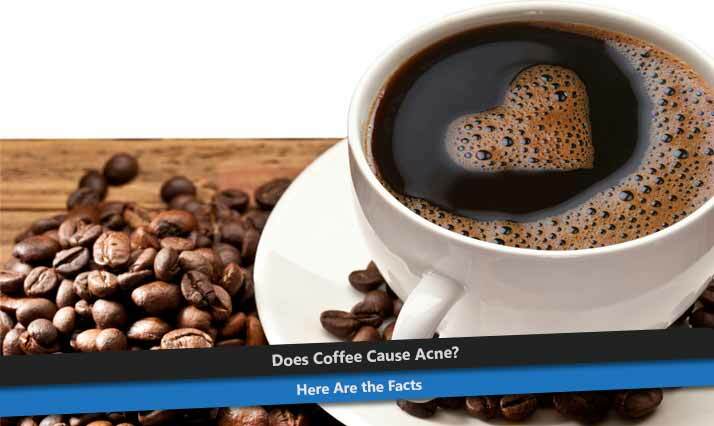 Some experts believe that this is the most reasonable problem with coffee consumption which can trigger acne. In scientific terms, coffee will trigger hyperadrenalism. It means that this thing is going to make the adrenal glands will be reacted to stressing event and increase the production of stress hormones. This is not good at all. When your body reacts to stressful events, you will normally go into “stress mode” such as activating your sympathetic nervous system. All those little daily stressful events at work and also relationship problems with your family, lover, and friends are those which can make you stress. When you are stressed, your body will be releasing three hormones, which are norepinephrine, epinephrine, and cortisol. Those hormones will prepare you for a “fight or flight” response. When your stress is gone, your body goes back into relaxation mode and those stress hormones will also gone. So, actually the acne also has a correlation with the hormone that causing stress. And that’s a bad news for you. In addition, coffee makes it worse. The fact is that coffee will magnify your body’s stress response massively. A study has shown that after we drink coffee, a stressful event will raise study object’s cortisol 211% compares to those who didn’t drink coffee. Moreover, our epinephrine also increase 233% higher. This means that coffee is absolutely making your body’s hormonal stress response. Coffee is bad news for your skin since the same stress hormones will trigger acne. Your insulin will pumped out by those stress hormones. A hormone which responsible for acne is working, at least in three ways which are insulin will make your skin produce excess sebum, insulin will increase your body’s inflammation levels that make your acne more red and swollen, and last insulin will trigger over-production of new skin cells that makes your pores will get clogged. In conclusion, coffee is indeed one of the causes of acne. It will make you become hyperactive in response to stress. Stress hormones will trigger acne and pump out insulin, which is responsible for acne.